Crude oil’s spectacular climb to the $60-$70 a barrel should boost government revenues for Asia’s major oil-producing countries such as Indonesia, Malaysia, Australia and Vietnam. 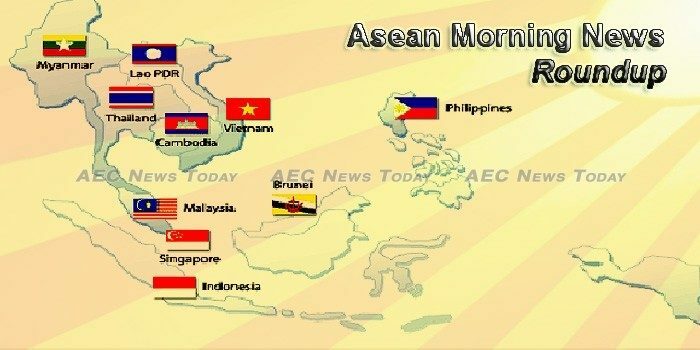 The members of the Association of Southeast Asian Nations have mounted pressure on India for clinching a liberalised pact in goods and services also involving six other countries, including China, by this year. India and the Association of Southeast Asian Nations have called for the completion of a binding code of conduct for parties in the South China Sea in the face of China’s aggressive expansion in the region. Palm oil output in the world’s top two producing countries is forecast to climb to new highs this year as output fully recovers from its El Nino-stunted 2017 level, pushing 2018 average prices down by 7 percent from last year, a Reuters poll showed. After a year and half of pushing through reforms since it was purchased by China’s Midea Group, Toshiba Lifestyle Products & Services, the former home appliances wing of Toshiba, is looking to grow again. Four foreign investors from India, Thailand, the Republic of Korea and the Middle East registered to buy 36 percent of the charter capital at the Power Generation Corporation 3 (GENCO 3) to become its strategic investors. Prime Minister Prayut Chan-o-cha was satisfied with the outcome of the ASEAN-India Commemorative Summit which agreed to enhance regional ties for mutual and sustainable economic growths. The visiting Indonesian president has encouraged Bangladesh for a more active engagement with Asean. Southeast Asia is facing a growing cooling crisis, but its people remain unaware of the threat that inefficient cooling technologies can pose to national development and the environment, finds a new whitepaper published today. Business in the Association of Southeast Asian Nations is entering a new phase as regional companies increasingly look to neighboring countries for investment opportunities. Southeast Asia is a region of rapid growth and huge potential. Passenger traffic in Southeast Asia grew by approximately 10% in 2017, when at least half of the region’s 10 countries recorded double-digit growth. The TPP, now revitalised after stalling following the departure of the U.S, is an opportunity for Australia to show itself as a credible leader on the international stage. In particular, Australia can take up the areas that the U.S drove forward while it was part of the deal: environmental sustainability, intellectual property, and rigorous governance and control mechanisms. The General Department of Taxation (GDT) collected $1.93 billion in tax revenue last year, a 30 percent increase over 2016 and well above the government’s own projections, according to the department’s director, Kong Vibol. Construction began yesterday on a $10 million factory in Kampong Speu province to process fresh fruit for international export, a first for Cambodia, though Agriculture Ministry officials could not confirm it would meet international standards yesterday. Indonesia’s PT Garuda Maintenance Facility AeroAsia said on Friday it would sell 2.34 billion new shares at a minimum price of 336 rupiah a piece in a share sale. The availability of adequate, equitable and affordable electricity will increase the investments and economic growth of the people. Indonesia has won a biodiesel dispute against the European Union (EU) at the World Trade Organization (WTO) that will pave the way for the Southeast Asian country to revive its biodiesel exports to the EU. The Transport Minister has made a trip to check the progress of the planned construction of the new Thai-Lao Friendship Bridge in Ubon Ratchathani. RHB Bank Lao Limited opened its third branch – Dongdok Branch- at Saphangmuek, Xaythany district, Vientiane Capital on Jan 26, 2018. Sime Darby Plantation Bhd., Malaysia’s biggest listed palm oil producer, is exploring a sale of a minority stake in its Papua New Guinea unit, people familiar with the matter said. Malayan Banking Bhd will raise its base rate (BR) and base lending rate (BLR) with effect from Monday, in line with Bank Negara Malaysia’s decision to the increase in the Overnight Policy Rate (OPR). The European Union (EU) should ban butter and not palm oil if it wants to use the environment factor as the basis for banning palm oil-based biofuels by 2020. Myanmar’s leader Aung San Suu Kyi is “isolated” and living in a “bubble”, according to veteran US politician Bill Richardson, who quit an international panel advising her government on the Rohingya crisis after clashing with the Nobel laureate. A major shake-up in Myanmar’s administration is in the pipeline as the government tries to tackle obstacles that stand in the way of economic progress, improved transparency and a more efficient bureaucracy. SINCE MYANMAR’S lack of adequate infrastructure may deter potential investors, the government must urgently bring infrastructure development into focus, according to the Myanmar Infrastructure Forum held on Friday. Philippine President Rodrigo Duterte told a group of Indian and Filipino business leaders in New Delhi that he would like to attract visitors to his country by offering “42 virgins”. Solar Philippines is challenging the bid of First NatGas Power Corporation for the 24/7 power supply of the Manila Electric Company (Meralco), coming from the 414-megawatt (MW) San Gabriel gas power plant. In what is certain to send the mildest germophobic mum into a frenzy a video circulating on social media only adds to the many reasons why leaving infants in the care of their fathers for even a short time is not necessarily such a good idea. On the other hand, if necessity is truly the mother of invention as claimed, the men in the video above deserve top marks. MORE direct investments flowed into Asia last year despite a decline globally – and China, Hong Kong as well as Singapore were the biggest recipients, according to the United Nations Conference on Trade and Development (UNCTAD). Prime Minister Lee Hsien Loong revealed on Friday that he will only hand over the prime ministership to his successor after the next General elections. The head of government was speaking to reporters at the end of his 2-day visit to New Delhi, where he co-chaired the Asean-India Commemorative Summit. Global political risk and uncertainty and US rate hikes are the key concerns for Singapore investment managers this year, according to findings from an annual survey by the Investment Management Association of Singapore (IMAS). The director of the National Institute of Development Administration (Nida)’s polling agency has vowed to resign after top administration bowed to political pressure in suspending the release of a poll on Gen Prawit’s luxury wristwatches. Vietnam’s wood and wooden product industry has prematurely achieved its export target set for 2020, as the sector ranked among the top ten areas that generated the highest export revenue for the country in 2017, according to statistics announced this week. PetroVietnam Gas (PV Gas), a leading state-owned Vietnamese energy company, is seeking government approval for a divestment plan to sell 30% of its stock to a strategic partner by 2020. I shouldn’t be surprised, but Vietnam’s imposition of stringent checks on imported vehicles has sent shockwaves through international automakers, local consumers and also investors who see the country.